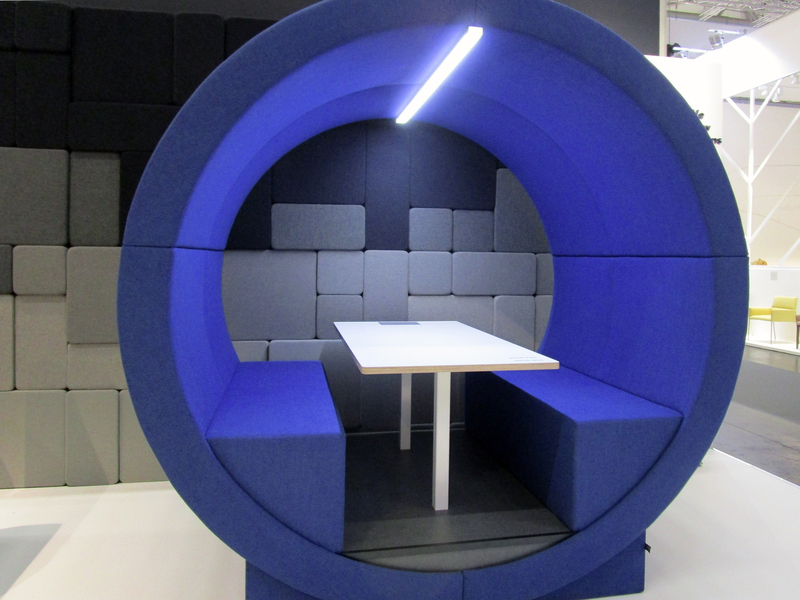 Meeting island with lounge character by Merryfair: Sound-insulating seating is designed to maintain privacy in the open-plan office. Working in open-plan offices might be very much in vogue, but it is not always pleasant: The person next to you is talking loudly on the phone, your colleagues at the desk opposite are conversing excitedly – everywhere there is a jumble of voices, phones ringing, the tapping of computer keys. Anyone unwilling or not allowed to resort to headphones will quickly find doing concentrated work in such an environment a challenge. 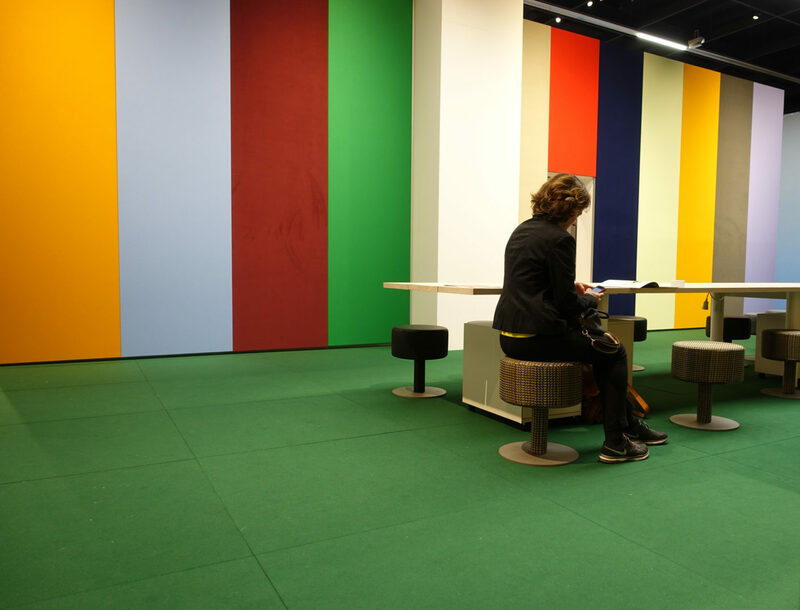 Sound-absorbing elements are designed to help prevent the background noise in large and often minimalist open-plan offices sounding like a weekly market. 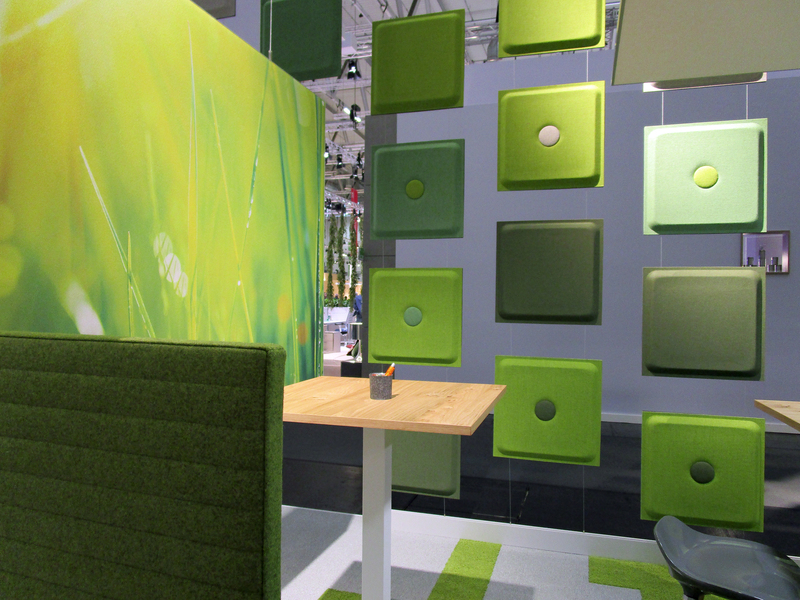 And these elements are available in numerous shapes and colors, as playful wall elements, for instance, decorative stands and flexible acoustic panels mounted directly on the desk. 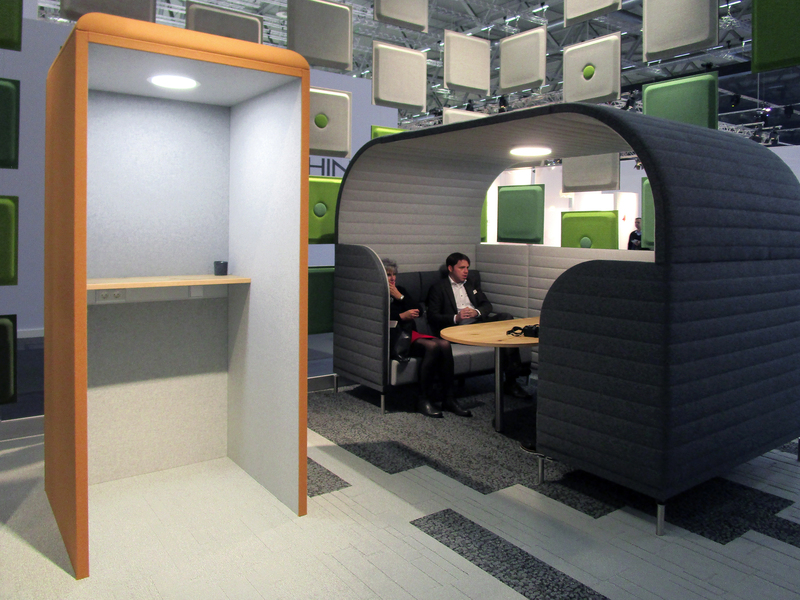 In addition, confidential phone calls can also be made in small cubicles reminiscent of the telephone booths from a bygone era. Those requiring greater privacy can retire to secluded soundproofed cabins – usually glass cubicles with sound-absorbing elements. You might still be visible, but you do have your peace and quiet. At the “leading international trade fair for the modern working world,” in short Orgatec, the topic of sound protection is omnipresent this year. Amidst so much materiality and cozy, lounge-style acoustic dampers it is easy to forget that this exhibition actually focuses on office furniture. The oh-so-popular plants as sound protection seen at the imm cologne in January are somewhat thin on the ground here – fabric, fabric, fabric is the name of the game. 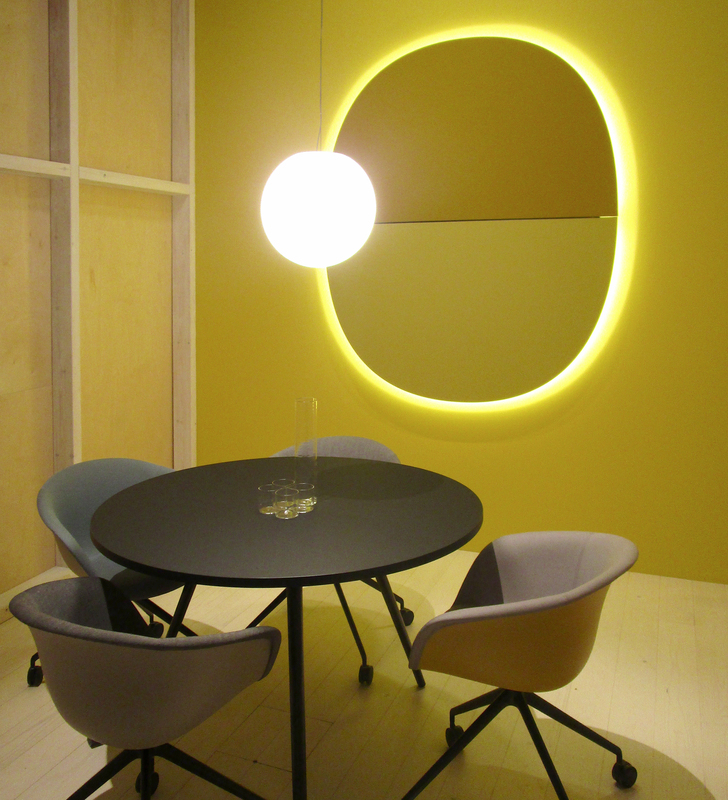 And in an office landscape with such a strong emphasis on fabrics, rectangular desks and streamlined office chairs almost appear out of place. 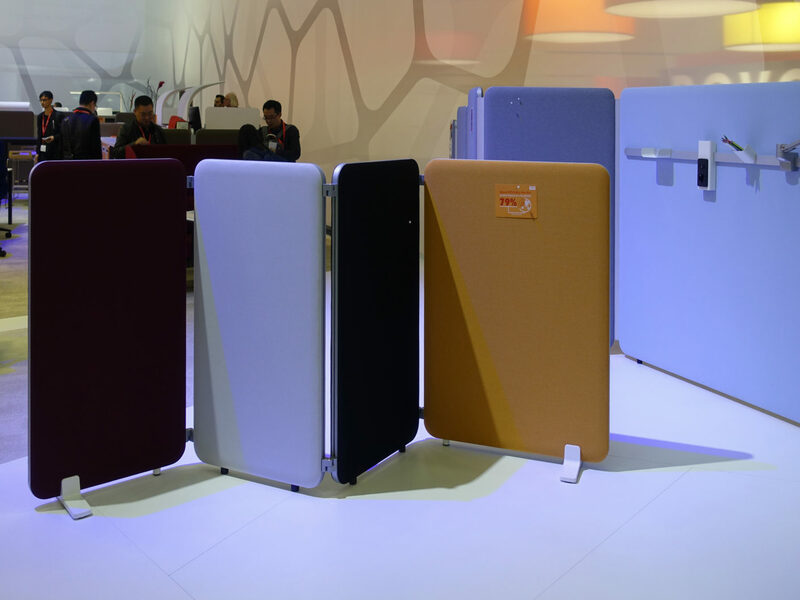 Airy insulation: The flexible noise-protection elements, for instance by AOS, are available in numerous colors and forms. 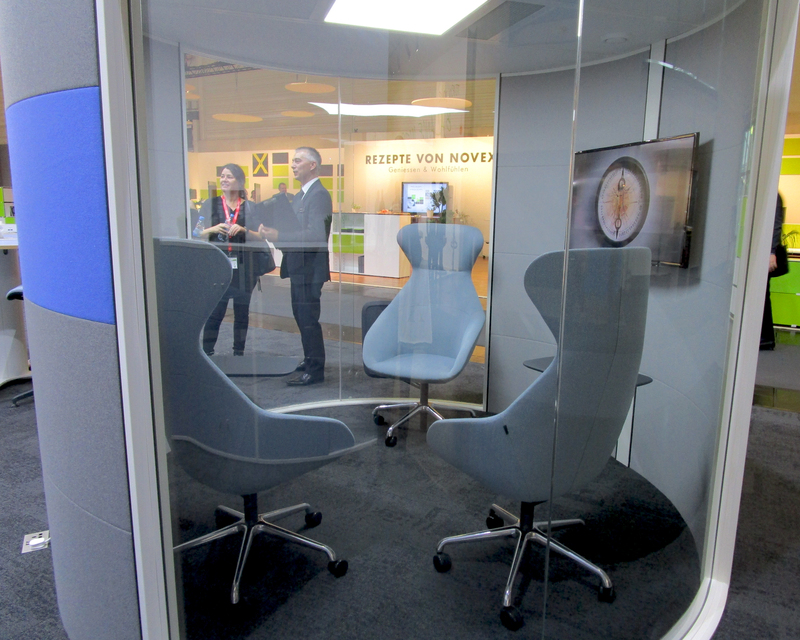 Retreat into the space capsule: Confidential conversations are safe in the bright blue sound-protection element by ABV. 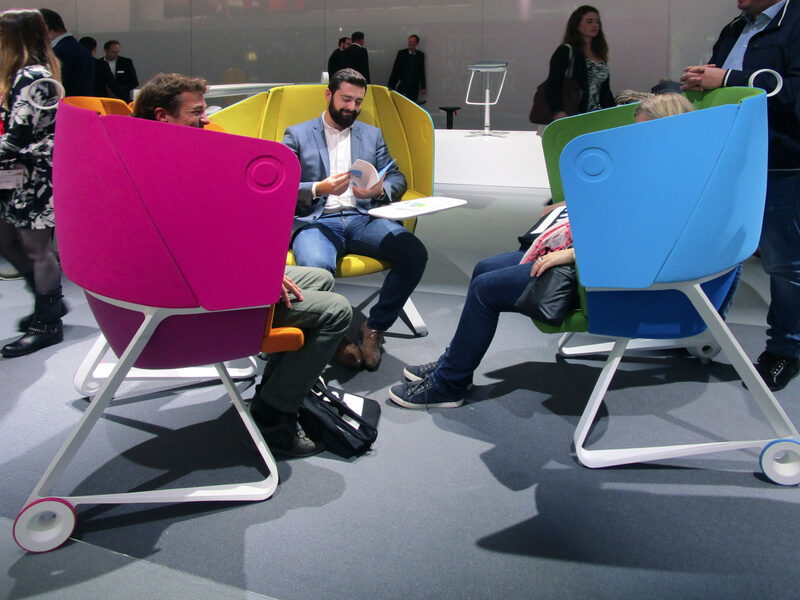 Up, up and away: “Baudot Zero” by Allermuir is adjustable and can be positioned in the room wherever it is needed. Under the hood: Anyone wanting to make a phone call can withdraw under a sound-protection hood. Back again: At AOS too there are telephone boxes in the office that call to mind bygone days. 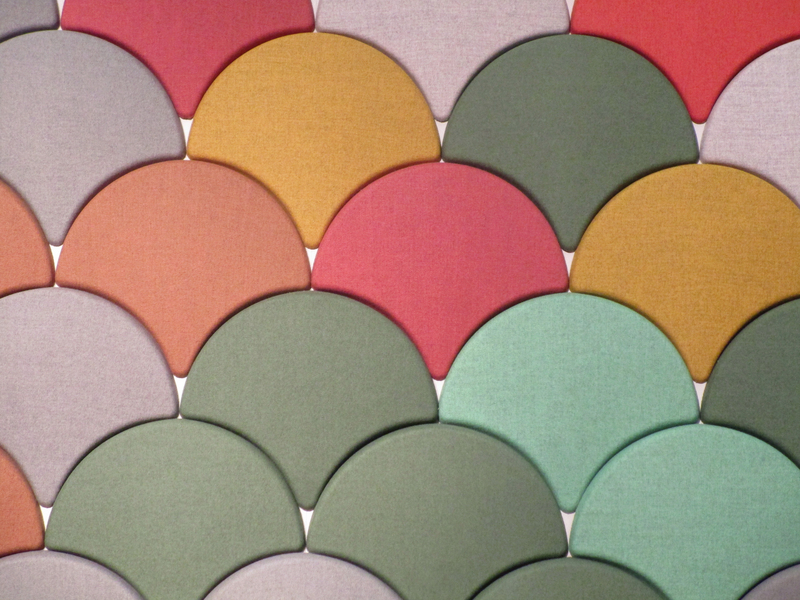 The acoustic panels “Soft Cells” by Kvadrat are made of at least 50 percent recycled aluminum and are resistant to damp and changes in temperature. 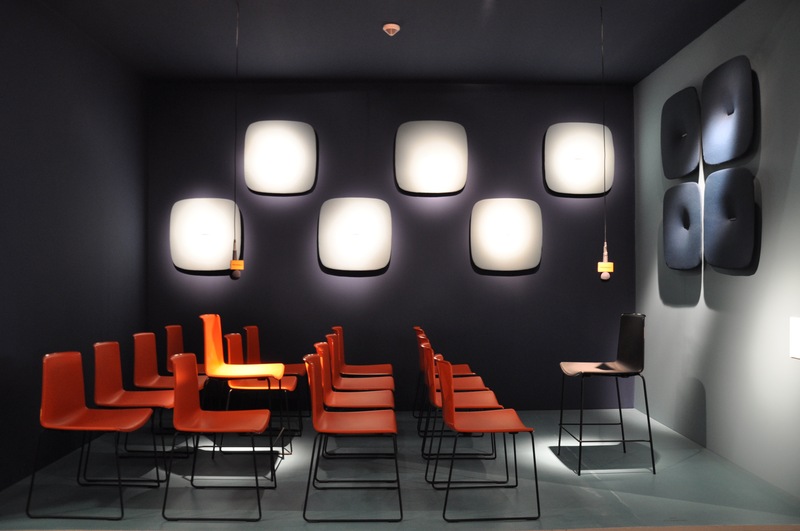 Acoustically effective partition wall: se:wall by Sedus provides both sound insulation and privacy protection and can easily be moved thanks to its low weight. The “Parentesit” panels by Arper can be adapted to all tastes with speakers and lighting systems. 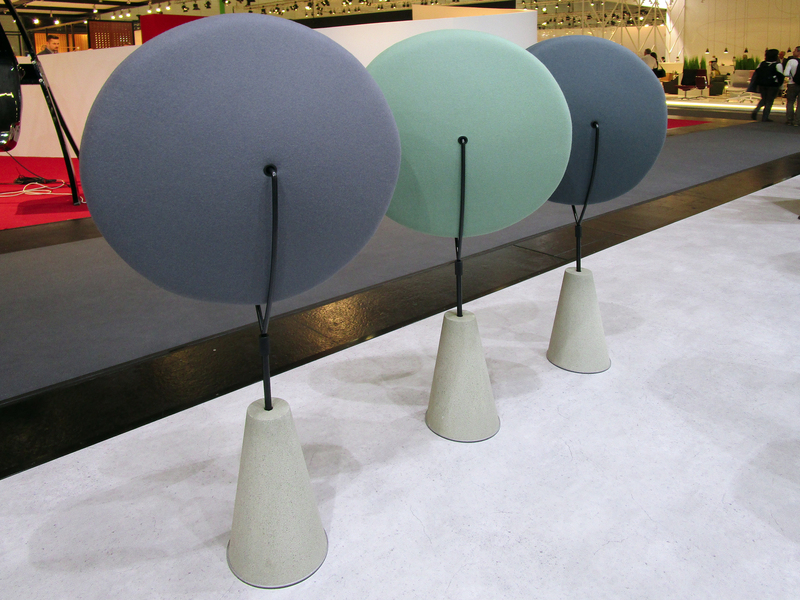 Variability is key: The cover of the new acoustic element “Snooze” by Pedrali can be changed. A classic: “Gingko” by Bla Station can be used to design colorful murals. 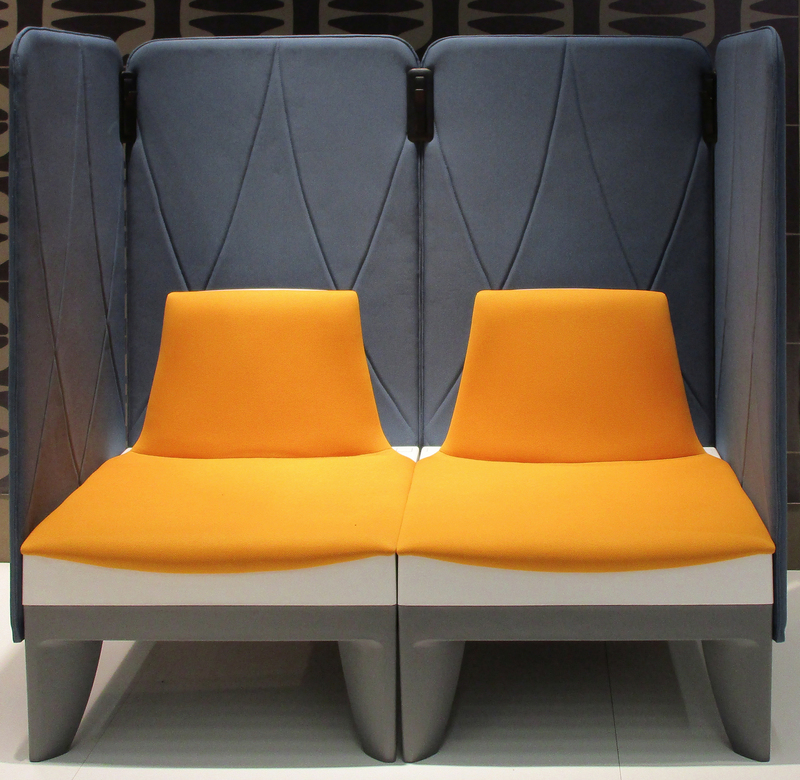 Wing chair 2.0: The side elements of “TeamUP” by ITO Design can be folded upwards as necessary. 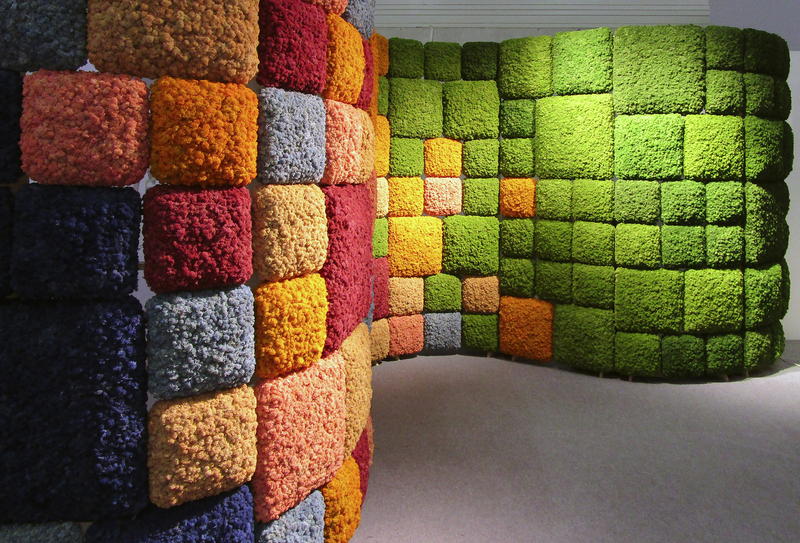 Nature retreating: Sound absorbers made of natural materials like reindeer moss (Nordgröna), which were popular until very recently, hardly featured this year. 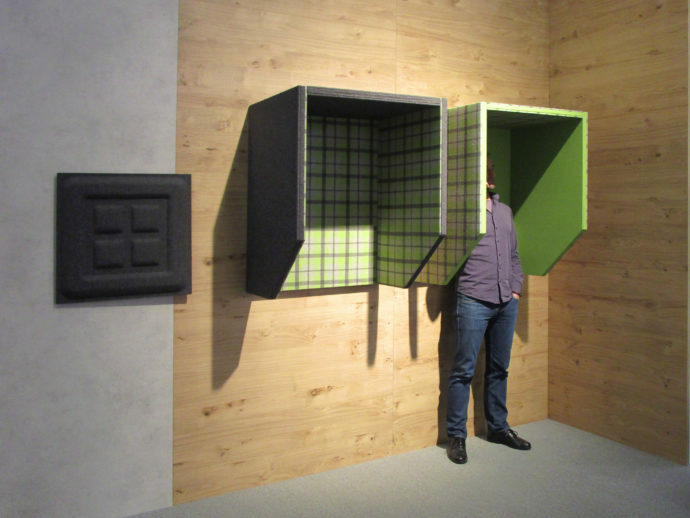 Close the door, all is quiet: As an alternative to the cozy cube, the fully sound-insulated room system, for example by Novex, is available for confidential conversations.